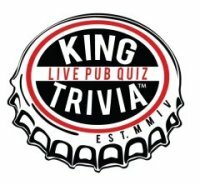 King Trivia Live Pub Quiz hosts trivia games in pubs and restaurants all around Southern California. The games are FREE to play and 100% open to the public. Thousands of people put their pride on the line and compete every week to win! These are people just like YOU! Upstanding citizens by day, beer-soaked Know-it-Alls by night. Think you have what it takes? Think you can compete? Prove it! Bring along some friends and experience King Trivia for yourself. For more information, visit www.kingtrivia.com.